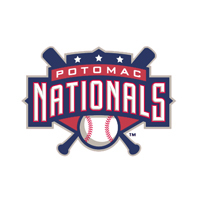 The Potomac Nationals (44-34, 6-3) shocked the Frederick Keys (34-44, 2-9) with seven runs in the 8th inning in the aftermath of a terrific starting pitchers’ duel to eclipse their regional Northern Division rival 7-1 at Pfitzner Stadium on Sunday evening. This triumph was Potomac’s 19th win of the season when the team is tied or trailing after six complete innings. The P-Nats’ victory guarantees a rubber match clash for Monday evening. The Nationals are (2-1) in their rubber match affairs in 2014. A scoreless stalemate lasted six innings amidst the epic pitcher’s standoff between Nationals RHP Austin Voth and Keys RHP Mark Blackmar. Both were dominant deep into the contest as Voth went 7.0 innings and Blackmar spanned 6.0 stanzas. Voth retired 11 batters in a row after issuing a walk to Frederick C Wynston Sawyer and a single to 2B Jerome Pena in the 3rd inning. Voth struck out seven, walked one, and surrendered two total base hits including a solo home run to Keys 1B Trey Mancini in the 7th which broke up a scoreless tie. The fireballer left the game on the hook for the loss but a surge of offense in the 8th allowed Voth to receive a no decision. Blackmar was very effective in the no decision as he gave up just two hits but no runs while walking three and striking out four. With the Keys holding a 1-0 lead and Blackmar in line for the win, losing pitcher, RHP Jimmy Yacabonis (0-1) came apart suffering a nightmare 8th inning. The Nationals plated seven runs on six hits and brought 10 men to the plate. Potomac C Pedro Severino walked and 2B Tony Renda sprayed a double to right-center field before Yacabonis balked in the tying run. Nationals SS Stephen Perez chopped an RBI single up the middle against a drawn-in defense on the infield to give the home club a 2-1 lead. The inning spiraled out of control for the Keys as LF Mike McQuillan roped a two-run single into right field and on the play received second base on an obstruction call. Yacabonis contacted McQuillan on his round of first base and thus McQuillan was granted second base. Then, 3B Khayyan Norfork blasted an RBI triple into the alleyway in left-center. Keys LHP Lex Rutledge in relief of Yacabonis entered and served up a two-run dinger to left field off the lumber of CF Will Piwnica-Worms, his third longball of the 2014 season. Nationals RHP Sam Runion (1-0) was the winning pitcher after hurling a spotless 8th inning that featured one strikeout. Potomac RHP Gilberto Mendez closed the Game Two proceedings out with a one-two-three 9th inning. Keys CF Glynn Davis popped out to Norfork in foul territory, RF Mike Yastrzemski grounded out to first base, and Mancini was down on a corner-to-corner grounder to wrap the game. Monday night is Dollar Monday sponsored by: The Washington Post with $1 hot dogs and $1 general admission tickets available only at the Potomac Nationals Ticket Office. In the game three finale on Monday evening with first pitch scheduled for 7:05pm, the Nationals will send RHP Blake Schwartz (1-0, 2.70) to the mound. The Frederick Keys have yet to announce a starting pitcher.